I was given a whole pile of past editions of house style magazines the other day. The ones filled with beautifully furnished homes, elegant dining areas, kitchens I would sell one of my kidneys for, and gardens that put the botanical gardens to shame. I sat and flicked through them looking for some inspiration. We moved in to our house a few months ago and it is pretty tired and in need of some freshening up. I want it say “we live here!” as soon as friends and family come to visit. 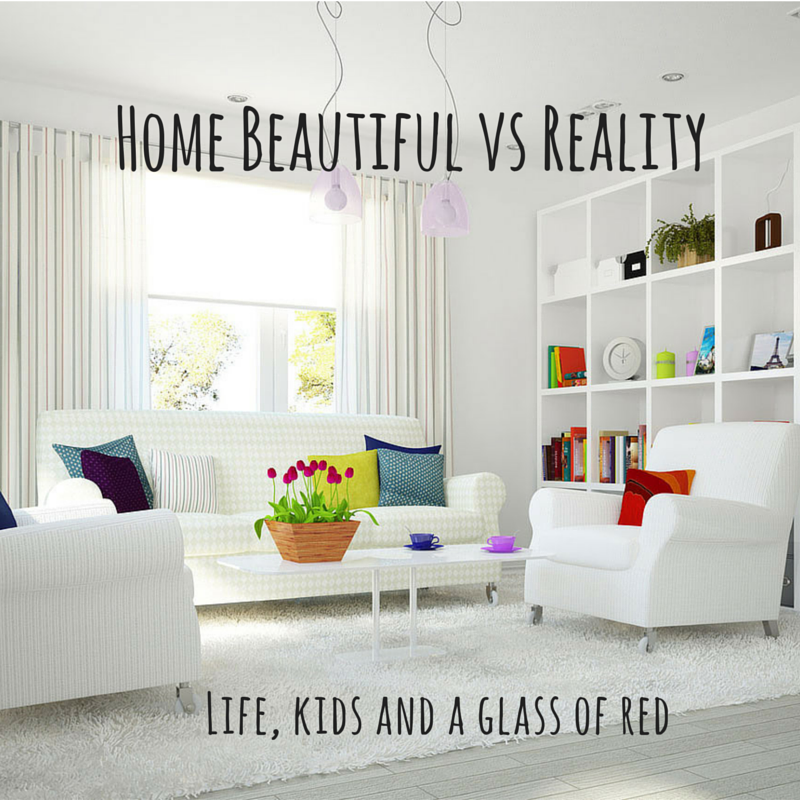 I want the house to reflect us and be practical for our needs.And as I sat there flicking through these gorgeous magazines, I came across a photo of a room that had been styled perfectly. Gorgeous couch, book shelves and little touches that just tied everything together. It was a photographers gold star kind of photo. You could use your fingers as a photo frame and it just worked. So I looked up and framed my fingers into a square to view our room through. And that’s when reality hit. Within the frame my fingers had formed, the scene was perfect. Neat and tidy, photo frames, fresh flowers, view of garden. Tick, tick and tick. But outside the frame of my fingers was a completely different picture. Chaos. Oh. My. God. No wonder I feel frazzled some days. Despite creating a small sanctuary for me – my desk, it is still amid this chaos. My little one metre space is between the linen cupboards and the upright freezer. And barricaded by the jogger pram and stroller to keep the border of my zone secure. Stylish. I know. I am by no means, a slob. I’m the opposite. Think Monica from Friends. But I have kids. And dogs. And a husband. < Previous What has happened to the simple act of kindness? Next > Versatile Blogger Award – cheers to that! I can totally relate to that! I have a 2 and a 3 year old. Both boys. Enough said! I’ve truly given up I have to say – 3 kids in 3.5 years and I’m still searching frantically for my sanity and a magazine-style home, one day! Nice to meet you, I love your humour! Can I make a suggestion? If you’re not against photos they are a great way to add another dimension to your fabulous and funny blog posts! P.s do you live in Ireland or am I imagining it? My craft room can relate but luckily I don’t have any children yet. I haven’t even got kids (unless you count the man baby,) and still I can’t get our place looking picture perfect. It’s never neat and tidy but it’s always lived in, and lived in with love and I know what I’d rather have. I think homes that scream out “we live here” are homes of the most heartfelt kind! Our home screams ‘we live here too’ in much the same way. I keep waiting for it to get better but the kids still leave stuff everywhere all the time. It’s frustrating. Love the daily dodging of toys on the floor! My home screams out “we live here” too. I wish I could live in a pristine house. I really do. But like you I don’t live alone. Is it wrong to want to have my own WHITE apartment with WHITE furniture and a view of a lake that is ALL MINE to escape to from time to time? My fiance and I bicker every night because I spend my day cleaning then at night he wants to go right to bed. No picking up the trash and dirty clothes and verbally tidying up so I don’t wake up to a mess. It drives me nuts which is why I think he does it lol. We’re trying to sell our home. It takes two adults three hours each of non-stop working to undo all the mess from our 6 children. Then, if we have back-to-back showings, it takes another three hours to “spot clean.” I keep telling myself I’ll miss some of it in a few years when they are grown. At least, I hope I’ll be able to miss it! I can so relate to this! My home practically screams in the face of anyone who enters it “Small children about, CAUTION!!!”. Some days it feels so pointless to put in so much effort cleaning and tidying when I know it will be destroyed again in 3 seconds flat. But for those 3 seconds it’s so pleasant and calming! This is totally our house. Our “adult space” has been overrun by “kid space”. There are days that I just give up and figure one big tidy at the end of the day will do ! Yep, I hear you! I do one big tidy up in the evenings too, otherwise I would be tidying and picking up all day! Glad to hear I am not alone. My kids have moved up from pulling dishes out of the cabinet (for the most part) to storing their toys in my cabinets. There are cars currently residing with my Tupperware. My home too screams out a two year old and a teenager live here. I had a huge grin of acknowledgement on my face when I read the part about nothing remaining in the cupboard once the door was opened. We definetly adhear to the lived in look in our house with a two year old and toddler plus our older kids here often. I had a big grin on my face when reading the part about an open cupboard needing to be emptied.